Teased as far back as this December, the rumored Theater Mode for Apple Watch is finally rolling out as part of a beta for the wearable's latest update. Now out for developer testing, the first beta of watchOS 3.2 give us a first glance at the Apple Watch's hinted courtesy mode, according to 9to5Mac. Theater Mode disables the Watch's 'raise to wake' feature, ensuring the screen doesn't light up in a dark theater at the slightest jostle of your wrist, and ensuring you won't get mean looks next time you go to the movies. 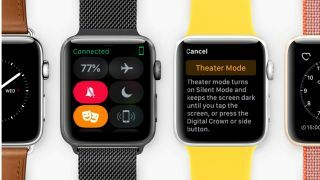 Should you need to keep an eye on something, notifications are still turned on in Theater Mode – to include haptic alerts – and can be checked by tapping the screen, Digital Crown, or side button on the Watch. Another feature incoming to the wearable via watchOS 3.2 is SiriKit, which allows the Apple Watch to launch third-party apps using Siri – a feature iOS users have had since the launch of iOS 10. While eager owners may want to get their hands on the latest watchOS beta before they head down to the cinema, the software is unfortunately intended for developer use and likely won't have a public testing, as Ars Technica points out.